Please measure your dog carefully before purchasing. Please feel free to let us know if you need assistance in sizing. Day and night, with Rabbitgoo Safety Dog Vest Harness, your outdoor adventure with your furry friend becomes a pure fun. This EASY CONTROL dog harness features an over-sized lifting handle offers an extra control when your dog needs instant control or in emergency situations, such as crossing busy street or encountering an obstacles. 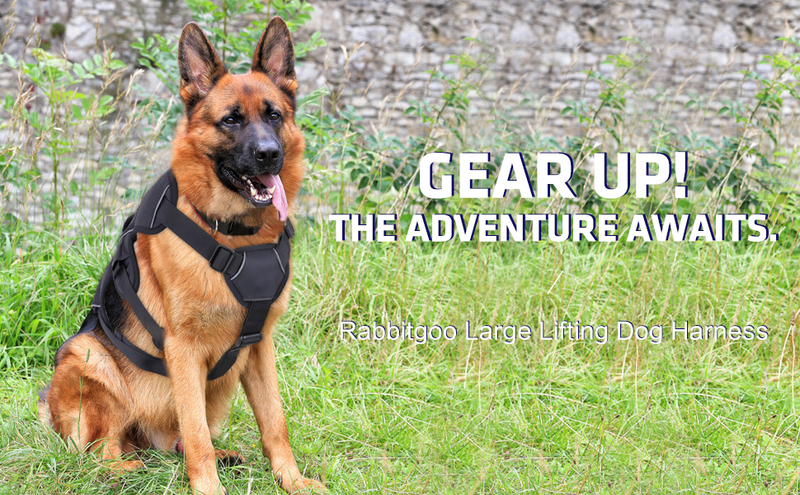 It comes especially handy when your dog needs additional help over rough terrain during hiking, climbing, and rescuing, or a quick lifting into vehicles. 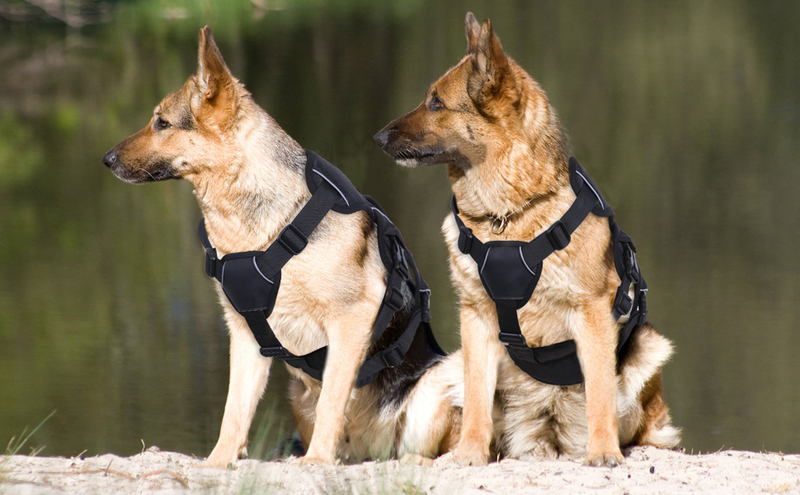 This is a VERSATILE harness - ideal for hiking, scrambling, rehabilitation, and mobility assistance, making it a great harness for working dogs and rescue dogs. It is also perfect for daily walking and training. The soft and breathable padding will give your dog a snug fit around the whole body, so your dog will feel secured and comfortable while wearing it, making the outing even more enjoyable. The materials that we used to craft our harness are all of premium quality, so your dog will wear it like a champ. Note: Suitable for medium to large dogs. Please measure your dog carefully before purchasing. Refer to the 7th image for the detailed size chart. Please do let us know if you need assistance in sizing. 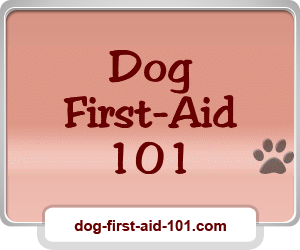 so that your adventure with your dog is under better control. 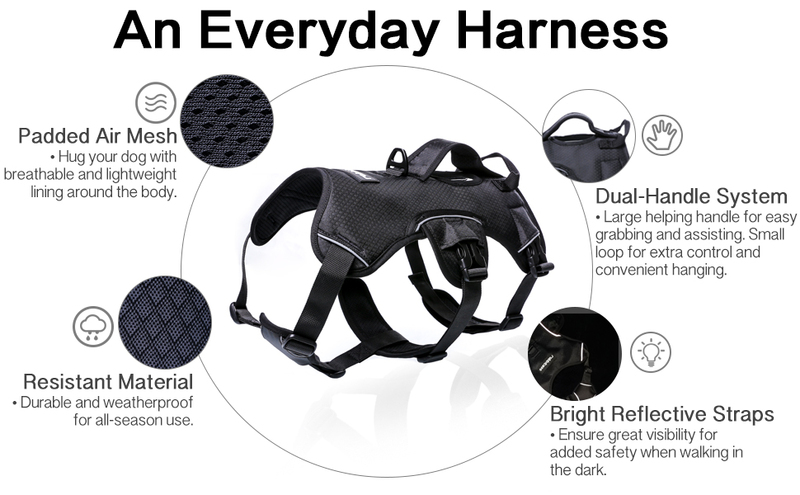 Each harness features 3 neck straps and 2 chest/belly straps which can all be freely adjusted. You can slide the adjuster and pull or push the straps to create your dog a perfect fit. Strong Buckles: Easy, Secure, and Durable. The side-release buckles are designed for easy-on and easy-off use. Simply buckle them up for a nice and secured fitting. Walking with your dog is one huge part of being a dog parent. What better way to promote the relationship between you and your dog than to take a nice walking in the open air? Having this in mind, we at Rabbitgoo are working hard to make sure that you can walk with your dog both safer and more enjoyable. We value your thoughts. Want to say something about the harness? Not 100% happy with your purchase? Tell us now so we can help! If you think you have chosen the wrong size, please let us know immediately for an easy exchange. We've tried multiple different harnesses on our 8 month old 55 lb puppy. This one has been the best so far. It's very light and secure. The dog can move freely without restricting his legs in any way. Getting his head through the hole is generally easy for us, but he has had a few fussy days. Would buy from this seller again. good product. Harness is just st as described and fits nicely. I’m glad that I bought two as we leave one in the car and keep one at home. Very happy with it. Excellent quality and workmanship in this Harness. I'm getting a new puppy in a month or two and will be using this product as my puppy grows into a big strong happy healthy helper dog. Since my puppy is a newfoundland/poodle, or newfiedoodke, she will grow pretty large. I absolutely love this style and fit on. A big kudos to the ream making this great harness for you beloved animals. Received harness in perfect condition yesterday. Very quick delivery. Have used it twice now and it works great! I tried 2 different harnesses from other vendors and they weren't the right ones. Then I got Rabbitgoo harness for one of my doggies and she was totally satisfied with it. The harness was very thoughtfully designed. This time, I got one for another doggie too.